Earn up to 4,480 reward points. 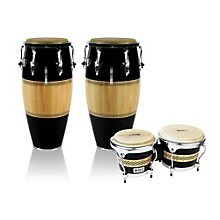 This LP conga set includes three of LP's most popular Performer Series hand drums: the 11" quinto, 11-3/4" conga and a free set of bongos. 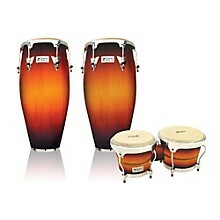 Features include Siam oak shells for warm, resonant open tones and sharp slap tones; EZ-Curve rims for hand comfort and tucked heads for a classic tone. The exterior drum shell design and steel bottoms provide extra durability and stability. Drum stands not included. Crafted from Siam oak, the bongo drums sing in the upper-mid frequencies with full open tones and crackle with high-pitched slaps. EZ-Curve rims and tucked heads also come standard. 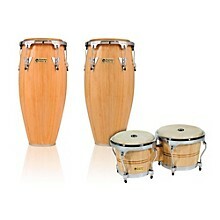 An excellent and affordable choice for beginning and intermediate players. 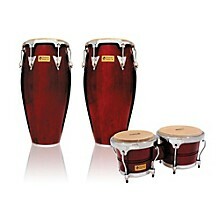 Drumhead sizes are 6-3/4" and 8". 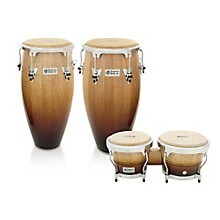 Bongo configuration: 6-3/4" and 8"
Get a quintet for the price of a duo. Order today!